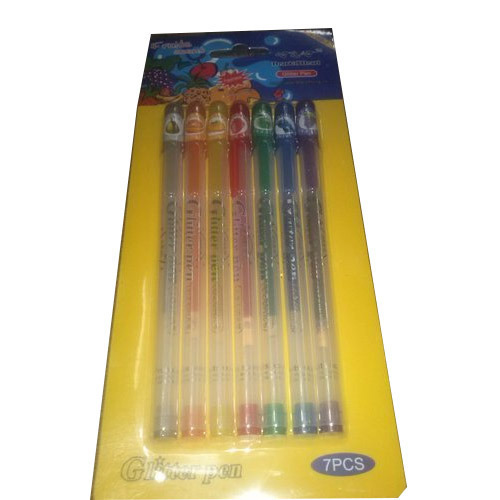 Being a client-oriented firm, we are presenting a quality tested array of Stylish Glitter Gel Pens. The Glitter Pen is widely in demand amongst the clients for its accessibility in different sizes and colors. Our pens are acknowledged for their attractive appearance. Moreover, our pens are able to enhance the drawing as well as writing and projects of the students. These pens are mostly used by parents for return gifts in birthday parties. Since our inception in the year 1965, P. Shamji & Co. have been dominant in Supplier, Trader, Distributor and Wholesaler of an assorted collection of superior quality Exclusive Ball Pens, Exclusive Roller Pens, Specialized Marker Pens, Gel Pens, Fountain Pens, Exclusive Gift Sets, Double Side Foam Tape, Adhesive Tapes, Visiting Card Holder, Jewelers Loupe, Examination Pad, Geometrical Box, Black Board Duster, Drawing Pin Clip, Rubber Stamp and Desk Globe. The whole product range is procured from the trustworthy and certified vendors, who manufacture these by employing quality approved material and avant-garde techniques of production. Broadly recognized for the features such as dependability, flexibility, easy usage and tenacity, our products are in sync with defined industrial norms. supported by an affluent vendor base, we are one of the renowned firms engaged in wholesaling, distributing and supplying an assortment of stationary products. For supplying the optimum quality products to our clients, we have recruited veteran procuring agents for choosing the suitable vendors. Further, we are able to fulfill the bulk demands due to the huge support by our vendors. These are selected by our procurement agents after being examined on certain parameters. 256, Abdul Rehman Street, 1st. Floor, Room No. 5, Backside Above Shah & Co.